Rather obviously my 51st birthday was a considerably quieter affair than last year’s raucous celebrations. 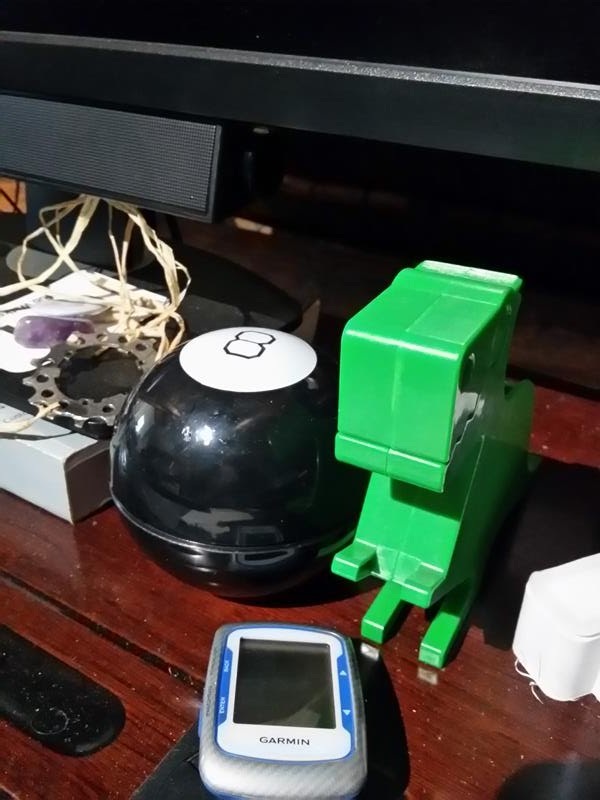 In amongst this year’s carefully chosen gifts was one that has found a prominent space on my desk: the Mystic 8 Ball now resides under my monitor, close at hand to help out with all manner of day to day decisions. Believing in higher cosmic powers and being of a generally more spiritual nature than me, Yoli looks at the answers it gives in a literal sense. Whereas with a love of games (and in particular poker) acquired from my father, I view it’s responses as pure chance – but curiously, this does not diminish their value. Random as the answer may be, it forces me to think more deeply about the question – especially where I disagree with the result. 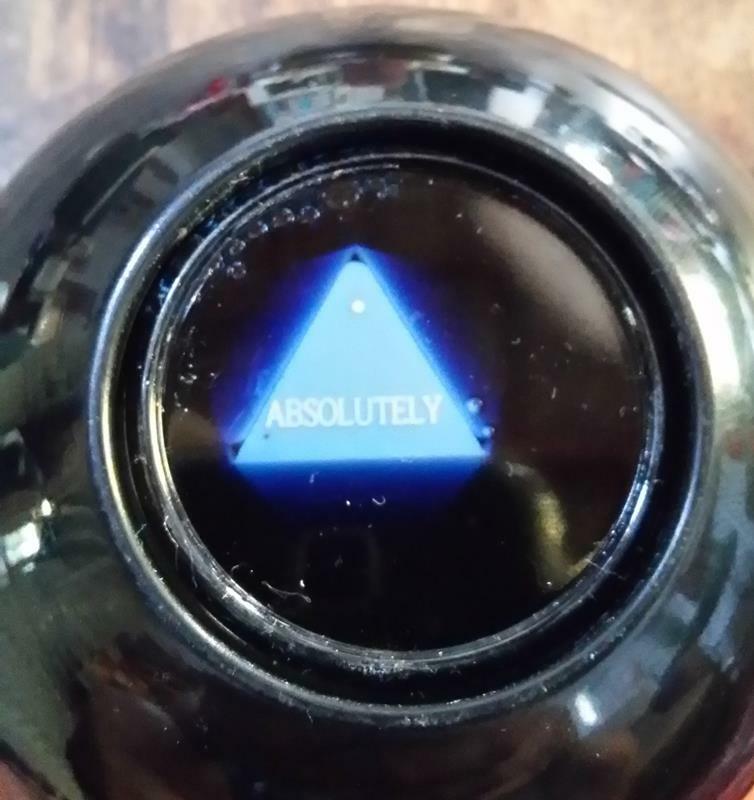 Despite having diametrically opposing views, we both derive a similar level of fun and value from giving it a shake and peering into it to see what it says on the burning question of the moment. All of which brings me to that topic I’ve been avoiding so far – “What next?“. It’s a question I’ve been asked a few times over the weeks since PBP, especially by friends on the regular weekly club rides. The answer handed out so far is that I’ve promised Yoli and Ben a year off from any seriously crazy and time consuming cycling adventures. Whilst completely true, it would be a little disingenuous to pass that off as the answer here. The PBP dream was years in the making, and despite having no declared goal it would be impossible to pretend there isn’t a list of potential cycling adventures, some of which have already reached the infatuation stage. So here is that list, and what the 8 ball had to say when asked about them. RAAM came onto my radar quite soon after finishing LEL. I forget the exact Facebook thread, but basically one of the LEL riders (Shusannah Pillinger) was training towards RAAM the following year. As with PBP, I found myself rapidly reading up on the event. But where PBP had seemed crazy but strangely doable, RAAM was a whole new level of insanity – Ultra Cycling. It was simultaneously terrifying and mesmerizing, and much like Joe Simpson’s account of the North Face of the Eiger from The Beckoning Silence, it was impossible not to imagine oneself into the story. So many aspects of RAAM involved my greatest areas of limitation (pace, riding in heat, altitude, Shermer’s Neck) that I tried to dismiss it from my mind. But as PBP preparations moved on, I started to question whether any of those limitations were absolutes: I was getting faster; riding qualifiers through the South African summer forced me to deal with heat better; and my neck problems hadn’t returned. The gulf between my performance and that needed for a RAAM attempt was still there, but I was starting to consider how to bridge it rather than just staring at it in awe. Very few solo riders have finished RAAM in the 32 years which it has been running. A significant factor is of course the enormous physical and mental performance needed to complete it – typically the failure rate in solo riders each year is 50% or higher. But that is really only part of the answer. In my opinion a significant factor in the small number of finishers is much simpler – very few actually get to the start line because of the huge cost of taking part. And therein lies my bigger problem. As well as the task of training and preparing properly to have a realistic chance of finishing, I’d need to find money to get a support crew of 8 to 9 people to California, hire 2 or 3 vehicles, and get them and me 3,000 miles across America. The budget needed to get one rider across one continent could easily reach a staggering fifty thousand dollars or more. Needless to say, it’s unlikely my family would agree to me spending ten year’s worth of luxury holiday money on one bike ride. And sadly I’d have to agree with them. The voices urging you towards a crazy ride aren’t so easily silenced by such everyday practicalities though. For now it remains a distant dream, but the shadowy corners of my brain continue to contemplate ways in which my efforts might add sufficient value to some brand or company that in return they may help me finance an attempt (or two) at RAAM. 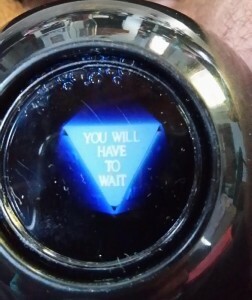 But enough of logic and reason, let’s see what answer the 8 Ball gave when posed the question “will I finish RAAM?. Yoli and I both laughed out laughed out loud at that – both of us knowing that my grinding persistence does have a habit of making ridiculous ideas become reality. I’m going to stick on the theme of RAAM for a moment because, when first gripped with the idea, I started looking at where and when you could do qualifiers. For quite a while I pondered the Deccan Cliffhanger, a significant reason being what had motivated Shu to ride it – to get conditioned to riding in heat. In truth though, if you pick the pick the right day and location you can ride in forty degree heat without ever leaving South Africa. And although the notion of a ride in India still sort of appeals, it possibly isn’t the most practical choice. It didn’t take long before the idea of combining a work visit with a qualifying ride came to mind, as had worked so well for LEL. Shu’s account of the Race Around Ireland made that sound way too hard as the next step, and I wasn’t sold on the idea of a TT based qualifier riding around the same track for 24 hours either. With those two discounted my attention turned from the UK office to our US office in Sausalito, the likely location for our annual management meeting in September 2016. Initially things seemed too good to be true – a Northern California qualifier was held in 2014 which started in Sacramento. But that disappeared from the calendar in 2015, and looking again I stumbled across the Silver State 508. Even with RAAM itself in the background until funding can be found, the Silver State 508 has stuck with me. Several of the qualifiers (I could name No Country for Old Men in Texas) seem to stand out as rides with a true spirit of adventure, proper endurance tests against a harsh yet beautiful landscape. And that’s the reason the Silver State 508 is still on my list – it’s impossible to ignore that completing it would qualify me for RAAM, but the ride itself is what grabs me. A 508 mile race out from Reno, across the Nevada desert passing through occasional wooden fronted towns that look like sets from a cowboy movie, before turning around and racing back – what’s not too like! So here’s what the 8 Ball had to say on the idea. Not quite the answer I would have liked to be honest, but it forced me to think about whether I really wanted to do the ride for it’s own sake and not just because of it’s association with RAAM. I can honestly say, after since seeing the pictures and reading accounts of this year’s edition that answer is yes. 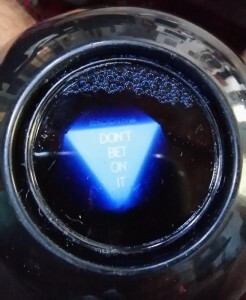 And therein lies the value of the 8 Ball – the real answer lies in the person asking the question. And finally we come to the most recent addition to my “big rides” wish list. I first heard about TCR over a year ago but didn’t give it much thought. As I started to realise any RAAM attempt could be some way off (if ever), TCR 2015 was just beginning and caught my attention again. I think what grabbed me on a second look was the simple ethos at the heart of the ride – TCR is as much about cycling as possible, with as little else to distract from that. So where on RAAM getting a rider across a continent involves this massive logistical challenge with huge expense and an unpleasantly large environmental footprint, TCR takes a more direct route – get on your bike and ride across the damned continent on your own. The continent this time being Europe (there is also a Trans America), and the rules being few and simple – no outside support, and private re-supply i.e. you find what you need on the way. Not unlike an Audax in fact, except as with RAAM drafting and otherwise helping fellow riders is forbidden, at least if you are in the solo racer category. There is a “pairs” category should you wish to ride it with a friend, although quite how that would work out on a ride of more than 4,000km over two weeks I’m not entirely sure. That last aspect is perhaps the one area which I’m less than 100% sure on. Although I love riding alone, I enjoy it most when done in the company of others – a paradox which long Audaxes resolve to perfection. Aside from phone calls home, a TCR attempt could be an very lonely affair. I was still in love with the idea when I posed the question to the 8 Ball – and it was only the response which forced me to look deeper inside at whether it was truly a ride I would enjoy. I like the answer though, I’m not going to bet against it either – it’s a definite maybe for 2017. Of course not, there’s at least two local single stage marathons I’ve yet to ride: Desert Dash Namibia; and The Munga. The first of these appeals very much to me, and it’s great to see that a new sponsor has been found (Nedbank) to keep the annual Windhoek to Swakopmund 24hour race across the desert going. It’s a ride I’ll definitely try and get a place on some day. The second, for reasons it’s hard to define, has yet to really strike a chord. 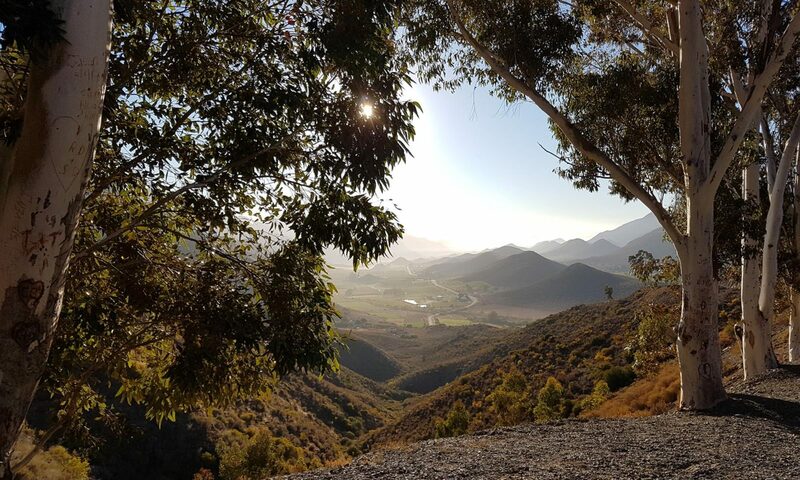 A 1,000km non stop race across the Karoo ought to be right up my alley, but even with the drastically reduced price the formula still doesn’t quite grab me. For this year though I need to come back to that promise of more family time for Yoli and Ben. Rather conveniently, less time cycling could be just what I need as the next stage of preparation towards RAAM or TCR. I definitely need to increase my riding pace to do well at either of those, so more concentrated interval work, and shorter faster races could server all of us perfectly.